Shimadzu developed the world’s first UV-VIS-NIR spectrophotometer with three detectors, consisting of a PMT (photomultiplier tube) for the ultraviolet and visible regions and InGaAs and cooled PbS detectors for the near-infrared region. With conventional instruments that use only PMT and PbS detectors, there is a drop in sensitivity in the crossover region between those detectors. 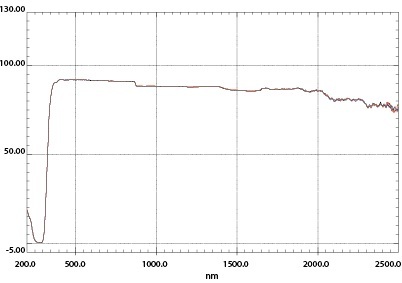 Using an InGaAs detector to cover this crossover region, however, ensures high sensitivity across the entire measured wavelength range, and gives a noise level of 0.00003 Abs at 1500 nm. In addition to the main UV-3600 Plus unit, the Multi-purpose large-sample compartment and the Integrating sphere attachment also feature three detector, enabling the high-sensitivity measurement of solid samples. 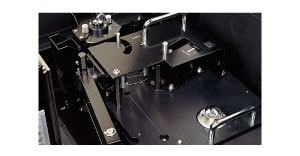 A high-performance double monochromator makes it possible to attain an ultra-low stray-light level (0.00005 % max. at 340 nm) with a high resolution (maximum resolution: 0.1 nm). The wide wavelength range of 185 to 3,300 nm enables measurement across the ultraviolet, visible, and near-infrared regions. 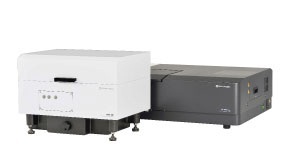 This instrument can perform spectrophotometry for a variety of applications. The three-detector Multi-purpose large-sample compartment or Integrating sphere options enable high-sensitivity measurement of solid samples. Use the ASR Series of absolute specular reflectance accessories to perform high-accuracy absolute reflectance measurements. In addition, temperature-controlled cell holders and micro cell holders are available to handle a wide range of measurement applications. Imaging devices, such as mobile phones, digital cameras, and security cameras, are all equipped with lenses. The transmittance of a lens is one factor that determines lens performance. However, because the lens itself focuses light, it is an especially difficult type of sample to measure accurately. Because of the focal capability of lenses, the total light passing through the spectrophotometer during the measurement of the baseline can be different than that after passing through the lens during measurement due to refraction. In such cases, the use of an integrating sphere can be used to collect all the light passing through the lens and provide for more accurate measurements. In addition, using the transmission-type integrating sphere included with the BIS-603 can reduce measurement errors. Furthermore, using the V stage, provided as standard on the MPC-603 multi-purpose large-sample compartment, allows measuring the transmittance of lenses of various lengths and sizes. The MPC-603 and BIS-603 are an ideal combination for measuring lenses. This multi-purpose sample compartment allows measurement of various shaped samples to obtain both reflection and transmission spectra. An integrating sphere is built-in to ensure accurate measurement of solid samples. This base plate is used to install an absolute specular reflectance attachment in the MPC-603 multi-purpose chamber. Research into solar-cell and photocatalytic materials often involves the measurement of the band gap, which is a basic physical property of the materials. 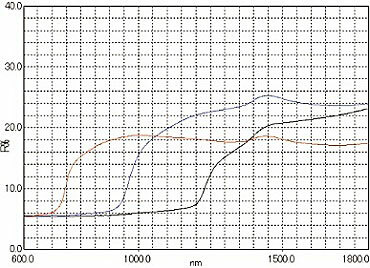 Shown below are the diffuse reflectance spectra of three semiconductor materials used in the production of solar cells using the ISR-603 integrating sphere. The absorption edge, the wavelength where the reflectance decreases, differs depending upon the sample type. This difference indicates a difference in the band gap* of the samples. The band gaps of the samples were calculated using the Tauc method, and were determined to be 1.63ev for GuGaSe2 (red line) 1.27 eV for Culn0.5Ga0.5Se2 (blue line) and 0.99 eV for CuInSe2 (black line). * The band gap refers to the energy difference between the top of the valence band filled with electrons and the bottom of the conduction band devoid of electrons. The wavelength range of the UV-3600 Plus is extremely effective for band gap calculations. * The samples are courtesy of the Wada Laboratory, Faculty Science and Technology, Ryukoku University. This attachment is used for the measurement of diffuse and specular reflectance. Transmission of liquid and solid samples can also be measured. Rolled plate glass is a plate glass with rough surface. When it is scanned by Small ID Integrating sphere, large steps at detector switching wave length may be occurred, and correct results may not be obtained. When It run by ISR 1503 with ID 150mm, and the sample was turned with 0, 45 and 90 degree, obtained spectra were almost same. And those spectra had very small steps at detector switching wave length. This 150mm dia. Integrating sphere attachment is used for measuring reflection spectra of solid samples, such as powders, papers, and cloth. It is also used for transmission measurement of solution and solid samples, and features high stability, excluding the influence of the state of the sample surface. It is effective for measuring solid samples with scattering properties, having an uneven surface. The accessory is ideally suited for color measurement. ISR-1503F is made by Spectralon®. 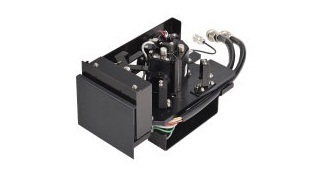 The UV-3600 Plus uses gratings for both the pre-monochromator and main monochromator. Our holographic diffraction gratings are designed to achieve high efficiencies and exceptionally low stray-light levels. Furthermore, to improve light energy efficiency, blazed gratings are used for wavelength regions that by nature have low light source energy or lower detector sensitivity. A G-G system that uses gratings for both the pre-monochromator and main monochromator ensures low stray light, with a constant optimal resolution of 0.1 nm in the ultraviolet and visible regions and 0.4 nm in the near-infrared region.